Trade shows are wonderful opportunities for businesses to connect with like-minded leads. This trade show season, get to know vendors, potential customers, and even potential partners with these tips and tricks on how to stand out from an endless chain of booths. First, choose a relevant crowd! It seems obvious, but don’t stretch yourself into fields where you may not be a good fit. If you’re a regular at a show, re-evaluate your impact and make sure you’re still collecting solid leads. Keep in touch with familiar vendors to strengthen your network. Search online for upcoming events and for larger trade shows. Ask customers – especially the decision makers – what other shows they go to. Look closely at the cost to exhibit versus expected foot traffic. If you expect a lot of leads, consider sponsoring the show for even more brand exposure. By sponsoring, you’ll be one of the first to select your booth location – a very important factor. Once you’ve decided which conferences and trade shows to attend for the season, let people know you’ll be there. Try to arrange meetings with important customers ahead of time. If you’re provided a pre-show list of registered attendees, send them an email with an offer they can’t resist. Mention your booth number and a strong call to action. “SHOW SPECIAL. We’re giving away a FREE TV!” If there’s a specific hashtag for the show, use it in social posts and tag the host. Blog about it. • Signage – POP Displays, A-Frames, etc. Shop here at Showdown Displays for inspiration. We’re a licenced distributor, so just let us know if you find something you love. Once you’ve staged your booth, view it from all angles. Is it approachable? Inviting? Exciting? The easiest way to stand out is with simple, contrasting colors and sharp, easy-to-read fonts. 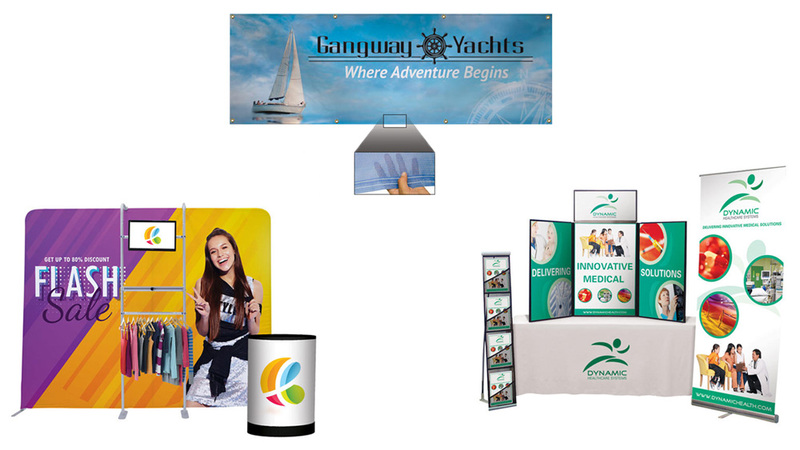 Less is usually more, meaning don’t clutter and allow your trade show materials plenty of space to shine. Your logo should be the first thing thing that every person walking by notices, followed by an impression of your product or service. Include product/service name, contact information, and website on every handout. Brainstorm ways to attract people to do business with you, instead of picking out freebies. Practice engaging people in conversation and be prepared for a 30-second “elevator pitch” of your company. Strategize on how to sell your products or services. Try not to sit behind the table or socialize with coworkers. Instead, actively ask attendees for their information. Let them know how you can make their lives easier. Make the first move, as most people will be shy. Be approachable and friendly, well-groomed, and well-dressed. Keep gum or mints on hand. If you’re selling on the floor, keep order forms nearby and get a credit card reader. Also, learn how to politely end conversation with someone who’s not a qualified lead. Don’t forget the free stuff. People LOVE free stuff, even if it has your logo imprinted on it. • Print materials are also handy giveaways, most common being postcards or product brochures. • Stickers are a great way to call attention to your brand, especially with clever designs and unusual shapes. • Treats are a guaranteed giveaway. Who can resist free chocolate? Take care of yourself. Wear comfortable shoes, remember to drink plenty of water, bring good coffee, and don’t skip breakfast! Take breaks when you need to. Walk the floor yourself, and keep an eye out for potential connections. Attend any special evening events, not just to unwind from the bustle of the show, but also to meet people in a relaxed setting. Follow up! You have 24-48 hours to reach out to the connections you’ve just made. Contact all leads as quickly as possible. Don’t let people forget the conversations they had with you. If you promised to send something, send it immediately. Your ultimate purpose is to connect, to strengthen existing relationships, and to sell!